Chronic immunosuppression with IMURAN, a purine antimetabolite increases risk of malignancy in humans. Reports of malignancy include post-transplant lymphoma and hepatosplenic T-cell lymphoma (HSTCL) in patients with inflammatory bowel disease. Physicians using this drug should be very familiar with this risk as well as with the mutagenic potential to both men and women and with possible hematologic toxicities. Physicians should inform patients of the risk of malignancy with IMURAN. See WARNINGS. IMURAN (azathioprine), an immunosuppressive antimetabolite, is available in tablet form for oral administration. Each scored tablet contains 50 mg azathioprine and the inactive ingredients lactose, magnesium stearate, potato starch, povidone, and stearic acid. Azathioprine is insoluble in water, but may be dissolved with addition of one molar equivalent of alkali. Azathioprine is stable in solution at neutral or acid pH but hydrolysis to mercaptopurine occurs in excess sodium hydroxide (0.1N), especially on warming. Conversion to mercaptopurine also occurs in the presence of sulfhydryl compounds such as cysteine, glutathione, and hydrogen sulfide. Azathioprine is well absorbed following oral administration. Maximum serum radioactivity occurs at 1 to 2 hours after oral 35S-azathioprine and decays with a half-life of 5 hours. This is not an estimate of the half-life of azathioprine itself, but is the decay rate for all 35S-containing metabolites of the drug. Because of extensive metabolism, only a fraction of the radioactivity is present as azathioprine. Usual doses produce blood levels of azathioprine, and of mercaptopurine derived from it, which are low (<1 mcg/mL). Blood levels are of little predictive value for therapy since the magnitude and duration of clinical effects correlate with thiopurine nucleotide levels in tissues rather than with plasma drug levels. Azathioprine and mercaptopurine are moderately bound to serum proteins (30%) and are partially dialyzable. See OVERDOSAGE. 6-MP undergoes two major inactivation routes (Figure 1). One is thiol methylation, which is catalyzed by the enzyme thiopurine S-methyltransferase (TPMT), to form the inactive metabolite methyl-6-MP (6-MeMP). TPMT activity is controlled by a genetic polymorphism.1, 2, 3 For Caucasians and African Americans, approximately 10% of the population inherit one non-functional TPMT allele (heterozygous) conferring intermediate TPMT activity, and 0.3% inherit two TPMT non-functional alleles (homozygous) for low or absent TPMT activity. Non-functional alleles are less common in Asians. TPMT activity correlates inversely with 6-TGN levels in erythrocytes and presumably other hematopoietic tissues, since these cells have negligible xanthine oxidase (involved in the other inactivation pathway) activities, leaving TPMT methylation as the only inactivation pathway. Patients with intermediate TPMT activity may be at increased risk of myelotoxicity if receiving conventional doses of IMURAN. Patients with low or absent TPMT activity are at an increased risk of developing severe, life-threatening myelotoxicity if receiving conventional doses of IMURAN.4-9 TPMT genotyping or phenotyping (red blood cell TPMT activity) can help identify patients who are at an increased risk for developing IMURAN toxicity.2, 3, 7, 8, 9 Accurate phenotyping (red blood cell TPMT activity) results are not possible in patients who have received recent blood transfusions. See WARNINGS, PRECAUTIONS: Drug Interactions, PRECAUTIONS: Laboratory Tests and ADVERSE REACTIONS sections. Homograft Survival: The use of azathioprine for inhibition of renal homograft rejection is well established, the mechanism(s) for this action are somewhat obscure. The drug suppresses hypersensitivities of the cell-mediated type and causes variable alterations in antibody production. Suppression of T-cell effects, including ablation of T-cell suppression, is dependent on the temporal relationship to antigenic stimulus or engraftment. This agent has little effect on established graft rejections or secondary responses. IMURAN is indicated as an adjunct for the prevention of rejection in renal homotransplantation. It is also indicated for the management of active rheumatoid arthritis to reduce signs and symptoms. Renal Homotransplantation: IMURAN is indicated as an adjunct for the prevention of rejection in renal homotransplantation. Experience with over 16,000 transplants shows a 5-year patient survival of 35% to 55%, but this is dependent on donor, match for HLA antigens, anti-donor or anti-B-cell alloantigen antibody, and other variables. The effect of IMURAN on these variables has not been tested in controlled trials. Rheumatoid Arthritis: IMURAN is indicated for the treatment of active rheumatoid arthritis (RA) to reduce signs and symptoms. Aspirin, non-steroidal anti-inflammatory drugs and/or low dose glucocorticoids may be continued during treatment with IMURAN. The combined use of IMURAN with disease modifying anti-rheumatic drugs (DMARDs) has not been studied for either added benefit or unexpected adverse effects. The use of IMURAN with these agents cannot be recommended. IMURAN should not be given to patients who have shown hypersensitivity to the drug. IMURAN should not be used for treating rheumatoid arthritis in pregnant women. Patients with rheumatoid arthritis previously treated with alkylating agents (cyclophosphamide, chlorambucil, melphalan, or others) may have a prohibitive risk of malignancy if treated with IMURAN. Patients receiving immunosuppressants, including IMURAN, are at increased risk of developing lymphoma and other malignancies, particularly of the skin. Physicians should inform patients of the risk of malignancy with IMURAN. As usual for patients with increased risk for skin cancer, exposure to sunlight and ultraviolet light should be limited by wearing protective clothing and using a sunscreen with a high protection factor. Renal transplant patients are known to have an increased risk of malignancy, predominantly skin cancer and reticulum cell or lymphomatous tumors. The risk of post-transplant lymphomas may be increased in patients who receive aggressive treatment with immunosuppressive drugs, including IMURAN. Therefore, immunosuppressive drug therapy should be maintained at the lowest effective levels. Information is available on the risk of malignancy with the use of IMURAN in rheumatoid arthritis (see ADVERSE REACTIONS). It has not been possible to define the precise risk of malignancy due to IMURAN. The data suggest the risk may be elevated in patients with rheumatoid arthritis, though lower than for renal transplant patients. However, acute myelogenous leukemia as well as solid tumors have been reported in patients with rheumatoid arthritis who have received IMURAN. Postmarketing cases of hepatosplenic T-cell lymphoma (HSTCL), a rare type of T-cell lymphoma, have been reported in patients treated with IMURAN. These cases have had a very aggressive disease course and have been fatal. The majority of reported cases have occurred in patients with Crohn's disease or ulcerative colitis and the majority were in adolescent and young adult males. Some of the patients were treated with IMURAN as monotherapy and some had received concomitant treatment with a TNFα blocker at or prior to diagnosis. The safety and efficacy of IMURAN for the treatment of Crohn's disease and ulcerative colitis have not been established. Severe leukopenia, thrombocytopenia, anemias including macrocytic anemia, and/or pancytopenia may occur in patients being treated with IMURAN. Severe bone marrow suppression may also occur. Patients with intermediate thiopurine S-methyl transferase (TPMT) activity may be at an increased risk of myelotoxicity if receiving conventional doses of IMURAN. Patients with low or absent TPMT activity are at an increased risk of developing severe, life-threatening myelotoxicity if receiving conventional doses of IMURAN. TPMT genotyping or phenotyping can help identify patients who are at an increased risk for developing IMURAN toxicity.2-9 (See PRECAUTIONS: Laboratory Tests). Hematologic toxicities are dose-related and may be more severe in renal transplant patients whose homograft is undergoing rejection. It is suggested that patients on IMURAN have complete blood counts, including platelet counts, weekly during the first month, twice monthly for the second and third months of treatment, then monthly or more frequently if dosage alterations or other therapy changes are necessary. Delayed hematologic suppression may occur. Prompt reduction in dosage or temporary withdrawal of the drug may be necessary if there is a rapid fall in or persistently low leukocyte count, or other evidence of bone marrow depression. Leukopenia does not correlate with therapeutic effect; therefore the dose should not be increased intentionally to lower the white blood cell count. Patients receiving immunosuppressants, including Imuran, are at increased risk for bacterial, viral, fungal, protozoal, and opportunistic infections, including reactivation of latent infections. These infections may lead to serious, including fatal outcomes. Cases of JC virus-associated infection resulting in progressive multifocal leukoencephalopathy (PML), sometimes fatal, have been reported in patients treated with immunosuppressants, including Imuran. Risk factors for PML include treatment with immunosuppressant therapies and impairment of immune function. Consider the diagnosis of PML in any patient presenting with new-onset neurological manifestations and consider consultation with a neurologist as clinically indicated. Consider reducing the amount of immunosuppression in patients who develop PML. In transplant patients, consider the risk that the reduced immunosuppression represents to the graft. Benefit versus risk must be weighed carefully before use of IMURAN in patients of reproductive potential. There are no adequate and well-controlled studies in pregnant women. If this drug is used during pregnancy or if the patient becomes pregnant while taking this drug, the patient should be apprised of the potential hazard to the fetus. Women of childbearing age should be advised to avoid becoming pregnant. General: A gastrointestinal hypersensitivity reaction characterized by severe nausea and vomiting has been reported. These symptoms may also be accompanied by diarrhea, rash, fever, malaise, myalgias, elevations in liver enzymes, and occasionally, hypotension. Symptoms of gastrointestinal toxicity most often develop within the first several weeks of therapy with IMURAN and are reversible upon discontinuation of the drug. The reaction can recur within hours after re-challenge with a single dose of IMURAN. Information for Patients: Patients being started on IMURAN should be informed of the necessity of periodic blood counts while they are receiving the drug and should be encouraged to report any unusual bleeding or bruising to their physician. They should be informed of the danger of infection while receiving IMURAN and asked to report signs and symptoms of infection to their physician. Careful dosage instructions should be given to the patient, especially when IMURAN is being administered in the presence of impaired renal function or concomitantly with allopurinol (see Drug Interactions subsection and DOSAGE AND ADMINISTRATION). Patients should be advised of the potential risks of the use of IMURAN during pregnancy and during the nursing period. The increased risk of malignancy following therapy with IMURAN should be explained to the patient. Laboratory Tests: Complete Blood Count (CBC) Monitoring: Patients on IMURAN should have complete blood counts, including platelet counts, weekly during the first month, twice monthly for the second and third months of treatment, then monthly or more frequently if dosage alterations or other therapy changes are necessary. TPMT Testing: It is recommended that consideration be given to either genotype or phenotype patients for TPMT. Phenotyping and genotyping methods are commercially available. The most common non-functional alleles associated with reduced levels of TPMT activity are TPMT*2, TPMT*3A and TPMT*3C. Patients with two non-functional alleles (homozygous) have low or absent TPMT activity and those with one non-functional allele (heterozygous) have intermediate activity. Accurate phenotyping (red blood cell TPMT activity) results are not possible in patients who have received recent blood transfusions. TPMT testing may also be considered in patients with abnormal CBC results that do not respond to dose reduction. Early drug discontinuation in these patients is advisable. TPMT TESTING CANNOT SUBSTITUTE FOR COMPLETE BLOOD COUNT (CBC) MONITORING IN PATIENTS RECEIVING IMURAN. See CLINICAL PHARMACOLOGY, WARNINGS, ADVERSE REACTIONS and DOSAGE AND ADMINISTRATION sections. Drug Interactions: Use with Allopurinol: One of the pathways for inactivation of azathioprine is inhibited by allopurinol. Patients receiving IMURAN and allopurinol concomitantly should have a dose reduction of IMURAN, to approximately 1/3 to 1/4 the usual dose. It is recommended that a further dose reduction or alternative therapies be considered for patients with low or absent TPMT activity receiving IMURAN and allopurinol because both TPMT and XO inactivation pathways are affected. See CLINICAL PHARMACOLOGY, WARNINGS, PRECAUTIONS:Laboratory Tests and ADVERSE REACTIONS sections. Use with Aminosalicylates: There is in vitro evidence that aminosalicylate derivatives (e.g., sulphasalazine, mesalazine, or olsalazine) inhibit the TPMT enzyme. Concomitant use of these agents with IMURAN should be done with caution. Use with Other Agents Affecting Myelopoesis: Drugs which may affect leukocyte production, including co-trimoxazole, may lead to exaggerated leukopenia, especially in renal transplant recipients. Use with Angiotensin-Converting Enzyme Inhibitors: The use of angiotensin-converting enzyme inhibitors to control hypertension in patients on azathioprine has been reported to induce anemia and severe leukopenia. Use with Warfarin: IMURAN may inhibit the anticoagulant effect of warfarin. Use with ribavirin: The use of ribavirin for hepatitis C in patients receiving azathioprine has been reported to induce severe pancytopenia and may increase the risk of azathioprine-related myelotoxicity. 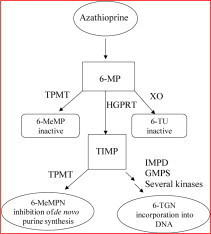 Inosine monophosphate dehydrogenase (IMDH) is required for one of the metabolic pathways of azathioprine. Ribavirin is known to inhibit IMDH, thereby leading to accumulation of an azathioprine metabolite, 6-methylthioionosine monophosphate (6-MTITP), which is associated with myelotoxicity (neutropenia, thrombocytopenia, and anemia). Patients receiving azathioprine with ribavirin should have complete blood counts, including platelet counts, monitored weekly for the first month, twice monthly for the second and third months of treatment, then monthly or more frequently if dosage or other therapy changes are necessary. Nursing Mothers: The use of IMURAN in nursing mothers is not recommended. Azathioprine or its metabolites are transferred at low levels, both transplacentally and in breast milk. 17, 18, 19 Because of the potential for tumorigenicity shown for azathioprine, a decision should be made whether to discontinue nursing or discontinue the drug, taking into account the importance of the drug to the mother. * Data on the rate and risk of neoplasia among persons with rheumatoid arthritis treated with azathioprine are limited. The incidence of lymphoproliferative disease in patients with RA appears to be significantly higher than that in the general population. In one completed study, the rate of lymphoproliferative disease in RA patients receiving higher than recommended doses of azathioprine (5 mg/kg per day) was 1.8 cases per 1000 patient-years of follow-up, compared with 0.8 cases per 1000 patient-years of follow-up in those not receiving azathioprine. However, the proportion of the increased risk attributable to the azathioprine dosage or to other therapies (i.e., alkylating agents) received by patients treated with azathioprine cannot be determined. Hematologic: Leukopenia and/or thrombocytopenia are dose-dependent and may occur late in the course of therapy with IMURAN. Dose reduction or temporary withdrawal may result in reversal of these toxicities. Infection may occur as a secondary manifestation of bone marrow suppression or leukopenia, but the incidence of infection in renal homotransplantation is 30 to 60 times that in rheumatoid arthritis. Anemias, including macrocytic anemia, and/or bleeding have been reported. Gastrointestinal: Nausea and vomiting may occur within the first few months of therapy with IMURAN, and occurred in approximately 12% of 676 rheumatoid arthritis patients. The frequency of gastric disturbance often can be reduced by administration of the drug in divided doses and/or after meals. However, in some patients, nausea and vomiting may be severe and may be accompanied by symptoms such as diarrhea, fever, malaise, and myalgias (see PRECAUTIONS). Vomiting with abdominal pain may occur rarely with a hypersensitivity pancreatitis. Hepatotoxicity manifest by elevation of serum alkaline phosphatase, bilirubin, and/or serum transaminases is known to occur following azathioprine use, primarily in allograft recipients. Hepatotoxicity has been uncommon (less than 1%) in rheumatoid arthritis patients. Hepatotoxicity following transplantation most often occurs within 6 months of transplantation and is generally reversible after interruption of IMURAN. A rare, but life-threatening hepatic veno-occlusive disease associated with chronic administration of azathioprine has been described in transplant patients and in one patient receiving IMURAN for panuveitis.21, 22, 23 Periodic measurement of serum transaminases, alkaline phosphatase, and bilirubin is indicated for early detection of hepatotoxicity. If hepatic veno-occlusive disease is clinically suspected, IMURAN should be permanently withdrawn. Others: Additional side effects of low frequency have been reported. These include skin rashes, alopecia, fever, arthralgias, diarrhea, steatorrhea, negative nitrogen balance, reversible interstitial pneumonitis, hepatosplenic T-cell lymphoma (see Warnings – Malignancy), and Sweet's Syndrome (acute febrile neutrophilic dermatosis). The oral LD50s for single doses of IMURAN in mice and rats are 2500 mg/kg and 400 mg/kg, respectively. Very large doses of this antimetabolite may lead to marrow hypoplasia, bleeding, infection, and death. About 30% of IMURAN is bound to serum proteins, but approximately 45% is removed during an 8-hour hemodialysis.24 A single case has been reported of a renal transplant patient who ingested a single dose of 7500 mg IMURAN. The immediate toxic reactions were nausea, vomiting, and diarrhea, followed by mild leukopenia and mild abnormalities in liver function. The white blood cell count, SGOT, and bilirubin returned to normal 6 days after the overdose. 50 mg overlapping circle-shaped, yellow to off-white, scored tablets imprinted with “IMURAN” and “50” on each tablet; bottle of 100 (NDC 65483-590-10). Store at 20-25 °C (USP Controlled Room Temperature) (68° to 77°F) in a dry place and protect from light. McLeod HL, Siva C. The thiopurine S-methyltransferase gene locus -- implications for clinical pharmacogenomics. Pharmacogenomics. 2002;3:89-98. Cote' CJ, Meuwissen HJ, Pickering RJ. Effects on the neonate of prednisone and azathioprine administered to the mother during pregnancy. J Pediatr. 1974; 85:324-328. 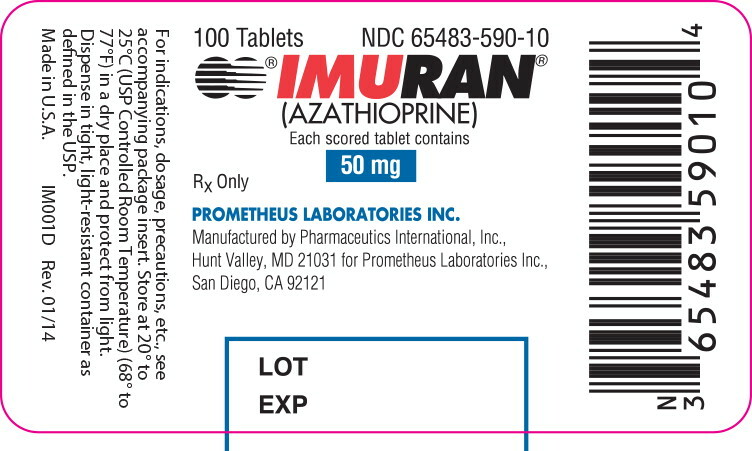 IMURAN® and ZYLOPRIM® are registered trademarks of Prometheus Laboratories Inc. Manufactured by Pharmaceutics International, Inc.
© 2001-2014 Prometheus Laboratories Inc.